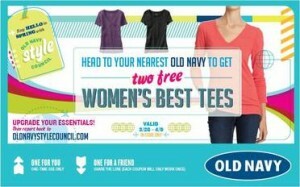 Possible 2 FREE Old Navy Tees from Crowdtap! Head's up! If you're a Crowdtap member, you may want to sign in and see if you have an Old Navy offer that will get you 2 FREE Old Navy tees, one for you and one for a friend! NOTE: Not everyone will qualify, but there will be future opportunities so it's best to get sign up now so you don't miss them! Along with these sample offers, you'll also earn points for answering short and simple questions that you can redeem for rewards like Amazon gift cards. Just log in daily to get your points! Thanks, Wheel n' Deal Mama!